Sacro Brace - SHIPS FREE! Lower Back Brace With Thermo Pad, manufactured by Champion, features a unique construction to deliver optimal support and comfort to the sacrum and lower spine. Featuring an adjustable design, this lower back support conforms to effectively support nearly every adult anatomy in existence. In addition to virtually fitting all body types, the Lower Back Brace With Thermo Pad delivers warmth for to soothe and relieve discomfort to localized muscles, joints, tendons, and discs. This lower back support, additionally, features a hook and loop closure that allows you to easily apply and remove the support. The hook and loop closure also allows precise control and support of the area, too. 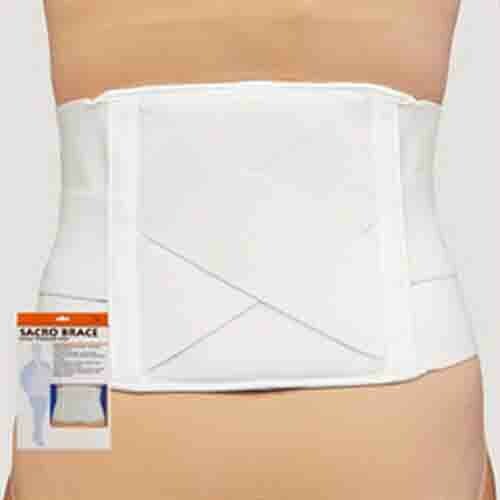 The Lower Back Brace With Thermo Pad helps to stabilize the sacrum and lower spine, allowing muscles in the region to relax. To further increase stability, this lower back support features a criss-cross elastic web over the back panel, too. To view other lower back braces to make the best decision for your individual needs, peruse the descriptions of these products, adjustable back brace and lower back support, too. Criss-cross elastic web that increases stability. Does not bunch up while sitting or stooping. Stabilizes the sacrum and lower spine. Thermo Pad retains moist body heat to provide soothing warmth to muscles. Application: To provide support to the lower back. This particular product fits up to waist sizes between 32-44 inches. 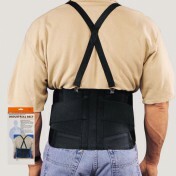 If you're looking for something similar, try the Industrial Back Support Belt or the Industrial Back Support with Straps.